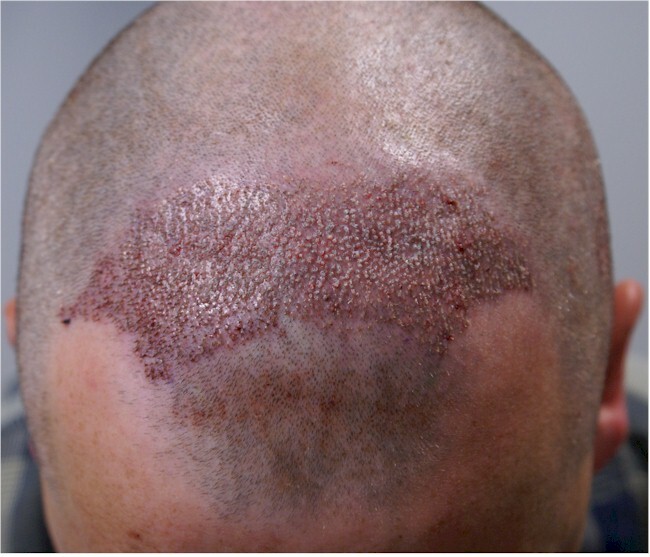 Here’s another round of mystery hair transplant photos. What do you think of the work, does it look natural, how many grafts, FUE or STRIP etc. We will disclose the doctor’s name, how many grafts, and the technique used in a few days. I guess it’s not bad but I don’t like his hairstyle. » I guess it’s not bad but I don’t like his hairstyle. How about a picture showing his hair combed back ? If he was to allow his existing hair to grow, might he have achieved a similar “look,” without a hair transplant? » similar “look,” without a hair transplant? I second that, it’s probably a very small fue and he grew his hair long. I wouldn’t be surprised this is BHT or fue/bht hybrid, roughly 1000-1500 grafts, notice how the hair is kind of coarse. » Here’s another round of mystery hair transplant photos. » Your comments are welcome. » used in a few days. I think he is aiming for the less is more look altho personally I would not style his hair like that. I guess this is fue, it’s probably not a bad result but ruined by the hairstyle unfortunately. I knew it. The result is average considering what he had done. He did grow his own hair long to make the after pic look fuller. now we are talking. This can’t be more than 1500 grafts or 2000 max. The yield is ok but the I don’t like his hairdo. I think he would look much much much much better had he cut his hair short. I believe that if one is going to the trouble of having an HT done, he should, at the very least, make sure his doctor secures (“straightens out”) his hairline. The temples are not properly sealed off, it looks like he is wearing a comb over pointing forward. Who s the doctor? Dr. A again ? Hairsite you forgot to tell us who the doctor is. Don’t forget to tell us who the doctor is. » Who s the doctor? Dr. A again ? No, its not our clinic and I am as clueless about the doctor as you. Its been over a week already since the thread started, so I guess theres no problem me posting. I am very curious to know who the doctor is. My first guess was Dr. A but V already proved me wrong. My second guess is Umar, BHT. Was the answer posted ? 40 cm2 covered by 1800 grafts. I suspect still images do not do justice to the actual results. Where possible, it is always a good idea to include video footage along with still images. This way there will be no confusion about the results. Also, bear in mind that this is only 6 months post op. The yield should improve another 30%-50% in another 4-6 months.